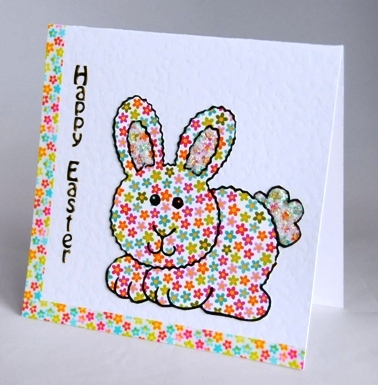 This top fold Easter card features a rabbit hand stamped from floral card. Her ears and tail are covered in clear glitter. This will not shed. There is a matching floral border on two sides of the card and the words Happy Easter are written vertically in gold lettering. The card is blank inside for your own Easter greetings. If ordering by phone, please reference card #745.